We Go to Christmas Markets | Sprezzatura, Y'all! One of the things I love about Christmas here are the markets that they have everywhere. 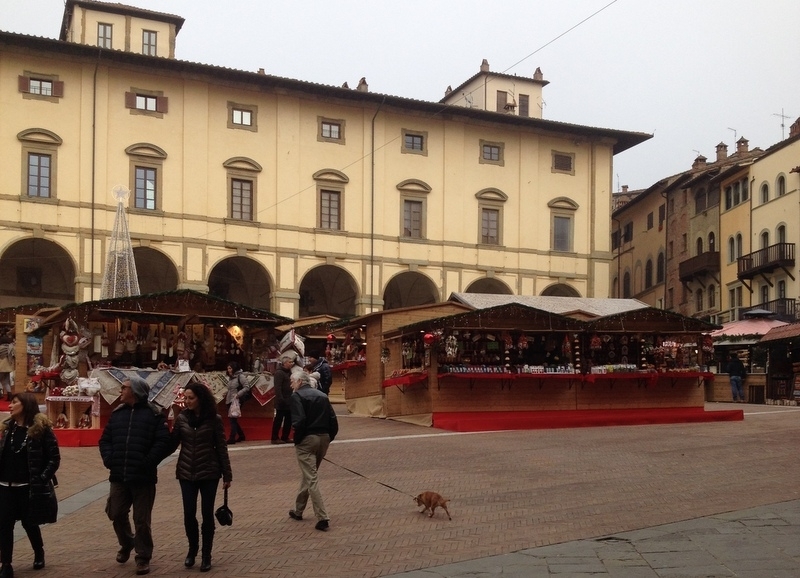 Today we drove over to Arezzo to their Christmas market. They have artists set up in tents around town and in the main piazza they have a Tyrolian themed Christmas market. I’m not sure why it’s Tyrolian themed all the way down here, but it’s very interesting. I think in northern Italy, Germany and Austria, they really are known throughout Europe for their Christmas celebrations. So they brought a little of that to Tuscany. We strolled around Arezzo, a really great town. It has its origins as an Etruscan settlement, and is believed to have been one of the 12 most important Etruscan cities. It’s not too big, but big enough that it has great shops and restaurants. The city center is traffic free and pedestrian only – something that gives it two thumbs up in my book. I can’t tell you how many towns and villages I’ve been in that were beautiful, but had cars whizzing through the little cobblestone streets so that you have to flatten yourself against the buildings so as not to be pulverized. No cars make for a very peaceful stroll. We browsed through the artists stalls and the Tyrolian stalls and had a great time. Very nice day. It was just cold enough to make you feel all Christmasy, but not too cold to stroll around. We stopped into a beautiful cafe that was used in several scenes in the movie “Life is Beautiful” and had a bite, a drink, and something warm. Perfect day for a hot chocolate. Hot chocolate here is nothing like hot chocolate in the U.S. Here it is, quite literally, hot chocolate. The drink you can chew. Divine. This week we will continue to savor the Christmas spirit here in central Italy. I can’t believe that Christmas is Friday. But I have to keep reminding myself that they continue to celebrate until January 6. So it’s really just starting. Thanks, Julie. It’s such a nice thing – I wish we could see them all! It’s wooden – gorgeous! Pasta tastes better when you wear Busatti aprons to make it! Good luck with the floor and Merry Christmas!